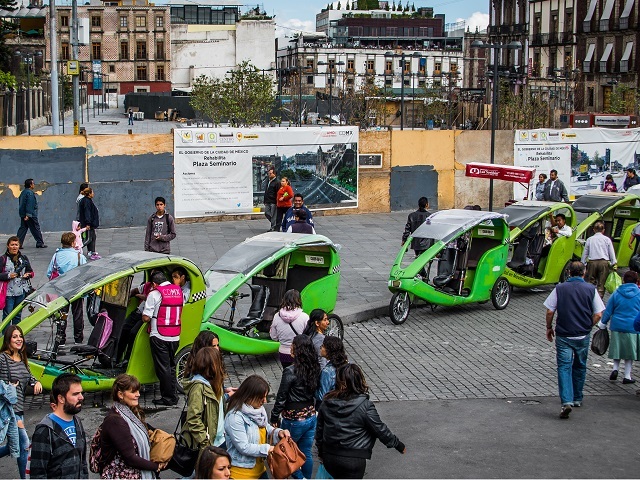 By encouraging car sharing and other transport-demand management (TDM) strategies, businesses in Mexico City can be part of the solution Mexico City’s persistent problems with traffic congestion. Photo by Ted McGrath/Flickr. A century of car-centric urban development has left our cities polluted, congested, and searching for sustainable solutions. Transport Demand Management (TDM) strategies can provide these solutions by combining public policy and private sector innovation to reverse over-reliance on private cars. The Moving Beyond Cars series—exclusive to TheCityFix and WRI Insights—offers a global tour of TDM solutions in Brazil, China, India, and Mexico, providing lessons in how cities can curb car culture to make sustainable transport a reality. In mega-cities like México City, more cars on the road bring greater traffic congestion, pollution, and road safety challenges. Road traffic incidents were responsible for 954 deaths in Mexico City in 2012, while motorized vehicles are responsible for 49 percent of greenhouse gases emitted in the area, and these problems are poised to worsen as the city’s vehicle ownership grows at 4.2 percent annually. These problems are well documented, but new research finds another issue with Mexico City’s car congestion—it creates economic costs to businesses and their employees. Mexico City’s Santa Fe district is a major commercial hub, with 7,000 housing units occupied and 118,000 jobs offered. More than 850,000 trips are made in this district every day, 64 percent of which come from business-related activities, such as employees commuting to work, company visitors, and suppliers. This part of the city lacks access to high-capacity transit systems like subways, trains or bus-rapid-transit (BRT). These conditions result in 41 percent of business-related trips being conducted by cars, 46 percent in low-quality buses (which can be unsafe and crowded), 8 percent in corporate shuttles and 6 percent in taxis. Cars are the largest contributors to Santa Fe’s traffic congestion and air pollution problems. Santa Fe´s car congestion is also thwarting economic growth. Businesses spend large sums of money on parking lots and vehicle acquisition. According to research by ITDP Mexico, office buildings in Mexico City allocate on average 42 percent of their land to parking spaces to support employees’ current transport habits. Furthermore, the intense traffic congestion is impacting workers’ productivity, as all the time spent sitting in the car ultimately reduces workers’ abilities to concentrate, think critically or even be present on time in the office. Employees are also personally deprived because of traffic. Someone who works in Santa Fe spends, on average, 26 days a year travelling to and from work—more time than all the annual holidays combined. The average car user in Santa Fe spends more than $1,700 USD a year on gas and vehicle maintenance, while in other parts of the city, a public transit user pays $900 USD a year on transport. For employees with the lowest salaries, transportation costs can eat up almost 20 percent of their annual income. Companies have the power to solve this challenge by incorporating transport demand management (TDM) strategies into corporate policy schemes. TDM strategies reduce travel demand by disincentivizing unnecessary driving, scaling up sustainable transport and stimulating long-term behavior change. While the public sector is already engaged in some TDM strategies in Mexico City—with mixed results—there’s also a huge opportunity for the private sector to play a transformative role. For example, in other cities in the world, like Seattle, companies have reduced car trips between 20 percent and 30 percent by using TDM strategies. To facilitate the development and implementation of TDM strategies in Mexico’s private sector, EMBARQ México created the Red Optimo network. The network brings together corporations that have successfully implemented TDM strategies, subject-matter experts, and companies that are starting to explore this field. The network allows businesses to share ideas, success stories and lessons learned, and provides a space to coordinate strategies between enterprises, like shared parking and shared-shuttles. In addition, the Optimo network will connect companies with shared mobility start-ups, which help implement car-sharing, ride-sharing, bike-sharing and other innovative solutions, resulting in a quicker implementation of TDM strategies. Currently, we have been involved with seven large corporations in Mexico, and we’re looking to expand our reach. The Optimo network will create an environment to empower the private sector to innovate the ways in which they move their employees.